A newer pointe shoe company, that began in the late 1980's. Originally brought-in to the United States and Europe, from Moscow, Russia. They are known as the "Beautiful Russian Pointe Shoes". European pink is their standard color for most of their shoes, and they are worn by professionals and students alike. The rare White or black satin shoes are sometimes found in little boutiques. The Grishko satin ribbon is often easily found in dance shops. Their ribbon is very soft, yet with a durable good quality, and one of the best available. 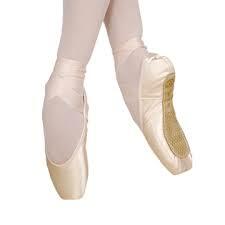 Sometimes with rehearsal pointe shoes, crossed-elastics are used instead of elastics and ribbons. However for performance, crossed-elastics, are too different a "look", to be accepted as a true classical ballet costume. Pointe shoes really are a costume adornment to tutu's, or tutu skirts. The criss cross of the ribbons also assure the pointe shoes stay on the ballerinas feet, during the moment of demi-pointe to full pointe. A time when elastics by themselves, have a tendency to slip-off. One of their newest models is the Nova pointe shoe. Grishko shanks may be classed that many models have tougher shanks,which should help them last a little longer. In how long they actually last, well, that depends on the type of shoe and the dancer. 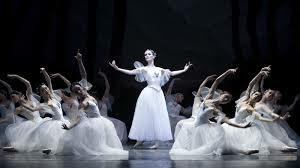 Normally though dancers are stating approximately one month for most pointe shoes including Grishko. For more info, visit Grishko's company website.